Jen, love the script on your sentiment! Very nice card. Love this happy birthday card! The balloons are so bright and cheerful! Very fun card. Love the balloon colors. Perfect to go with the sentiment. A festive card and I love the colours you used! Love this! What a happy card! Very nice card, I love it. Very pretty card! It must be an honor to be a part of the team that's my dream! Just to create new project tutorials I want that so bad maybe one day! Beautiful card, do love the sentiment. That card says "PARTY"! Nice work. I love the clean and simple look of the cutout balloons and the scripty sentiment! Great card! I think I need that Happy Birthday stamp. Great card! Now I need to go pull that ME stamp set out to play! OMGoodness Jen, how cute is this. I love balloons on birthday cards and your placement of them is perfect! Balloons are awesome for birthdays! Sometimes a CAS card says it all. A CAS beauty with fun balloons! A wonderful celebration happening alllll over your card! Love the sentiment font; bold and pretty! Love your card! I enjoy watching what you create each week for the blog. Great card! I love the big scripty Happy Birthday! Can't quite figure out what you used for the balloons though. 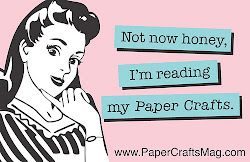 Is it handmade papers? Or maybe distress oxide? Whatever it is they are great! Such a fun birthday card, Jen! Very stylish clean and simple card....nicely done. I love that stamped sentiment. What a fun card! So cute! Great card! Love how you did the balloons. Love that Happy Birthday stamp from Mama Elephant. Such a simple and pretty card. Love it! Your card is so cheerful and cute! Hi Jen, love your birthday card ... balloons, sentiment, colors. Really fun card. I love the scripty sentiment, it's just beautiful! Super cute birthday card!Thank you for sharing,Jen! Absolutely love your idea and it is gorgeous yet simple. Gives me a whole new perspective on simple but wonderful! I love that happy birthday font! Cute card! I love the scripty "Happy Birthday". Love the big sentiment and how it's framed by the balloons! Beautiful punched, or possibly die cut, balloons! Jen... thanks for all the wonderful challenges and kind comments over the years! A very pretty balloon card, Jen! Love the Happy Birthday too. Fabulous card - as always! Great Card Love that sentiment. What a great card! I can see why you are on the team! Great birthday card - very "happy". Like the textured balloons and star. Love this happy card! Great colors & awesome design! Beautiful balloons, an amazing sentiment and the perfect bit of sparkle...... fabulous!! Super cute idea for the balloon "strings!" This is a great CAS design!! beautiful card and great design! Congratulations to you as well as CASology then, quite a remarkable achievement to be in from the start! Here's to the next five too!!! Cute card! Love the font on the sentiment, very pretty. Great card! The bling is a terrific touch! Love this card, so cheerful! Simply beautiful. The sentiment font is lovely. Love the font used on that sentiment! Love the shimmery balloons, the sentiment font looks wonderful!! This is such a happy card!! What a pretty birthday card. Can't imagine anyone that would not love receiving that one. Festive and fun card...love your balloons! Super fun card, Jen! Loving those balloons! What a great b'day card!!! Beautiful scripty sentiment and I love how you placed these fun balloons! Really fabulous card, Jen!!! Fabulous card with these wonderful balloons. Love that you used patterned paper for the balloons - super clever; extra bit of interest added. wonderful card Jen for this 5th birthday!! Super cool card, great hop! Love the dimension of those balloons over that big sentiment. Great card. Such a great bday card - love everything about it! super fun card for anyone! Fun card, love the font of the senitment! Wonderful birthday card!!! Love the script on that sentiment stamp!! That is awesome dedication to a design team, Jen! Love the fancy sentiment script with the fun balloons. Very cute balloons and such a pretty sentiment stamp! Congrats on 5 years as DT on this great challenge blog! What a fun card Jen! Your balloons are incredible! Thanks for all of the inspiration you always give me!! The curvy sentiment with balloons is looking awesome. Who doesn't love a good ballon card, yours is a great example! Fabulous card, love the balloons and fun design. Gorgeous card! Love the sentiment. What a cute simple card!! Love your card! The sentiment is just fabulous! A beautiful card and love the glitter. 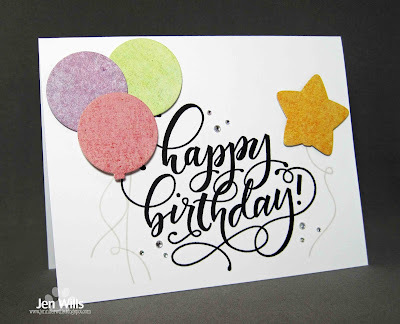 Such a pretty CAS card..
Lovely card, the balloons look great accentuating your pretty sentiment. Love the bold scripted sentiment and the star shaped balloon! Love how your balloon strings frame the sentiment. The addition of a star balloon is a plus !! I love the hand lettering sentiment, always work ! Beautiful card. The sentiment is an eye-catcher. Love the large sentiment with the happy balloons! Fun card! I love those big sentiments. Such a happy card! Love the scripty sentiment with those pretty balloons. cute card ,plain and simple!! Fab CAS card and love the sparkle I think is on the balloons perfect for a party and happy birthday too thanks for sharing over the past 5 years all the great cards you do. Love that font for the birthday sentiment! Fabulous card! Wonderful find! I haven't played along yet! I never know how to use large sentiments like this but you have inspired me to try. This is amazing design!! Super celebratory card, love the big sentiment with the balloons and the subtle strings. Very nice birthday card. Well balanced with the sentiment. Gorgeous card, love the texture of the star and balloons! Love those big scripty sentiments from Mama Elephant. Looks great here with your pretty balloons! Love your beautiful balloons around that fabulous and scripty sentiment!!! Beautiful card!. I love the cursive writing....and the bright and colorful balloons. Made me smile. What a fun card. Love the pretty script Happy Birthday. So pretty, Jen! Love that fabulous sentiment! Beautiful card! So pretty with your scripty sentiment. Love this! What a fun card! Fabulous card! the scripty font is really fun with the balloons. :) I also love the little bit of texture on the balloons and the star! TFS! Such a stylish CAS design! Congrats on making 5 years with the CASology team Jen..it's happy anniversary to you too! Lloving that swirly script with the balloons! I love the simplicity of your card. Thanks so much for sharing your creations! Lovely card! The colors are so pretty together. Wonderful card! I almost thought your balloons were felt! What a fun birthday card! I love the sentiment! Beautiful card! Love the font of the happy birthday stamp! LOVE the focus on the gorgeous sentiment! Wonderful card. Sweet card! Love the big sentiment! Such a great simple prompt... balloon 🎈!!! Like the balloons on this card. . .especially the clever star shaped one. Great idea. Thanks for sharing your design on the blog hop. Loving those balloons! Great card! The big sparkly balloons a re the perfect accents for the large scrit sentiment. Congrats for being on the DT for Casology. Love your Happy and Fun Card! A great CAS birthday card. Love the fun balloons! 😍 Jen! Your CAS design is a perfect fro mass producing, thanks for the inspiration and congrats 🎉 to CASology!! Congrats on your 5 years with CASology-- that is awesome! This is another terrific CAS card of yours, and I love that sentiment. Beautiful balloon card. Nice inspiration. Great clean design ...great interest on the balloons. I still love balloons and I'm a grownup! I love the movie UP because of all the colorful balloons. Your card is very colorful like the movie. I love the Happy Birthday calligraphy! It's so fancy! What a nice card for someone's birthday. Thanks for showing us your card and for giving us the chance to win something. I hope I get to win! Such a striking card.. the layout is fantastic! The glitter balloons are just too much fun! I love the pretty color and cool texture of your balloons! 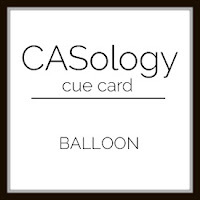 Happy 5th anniversary to all of you at CASology! Mixing balloons with a star - great idea! Thanks! Such a pretty layout with the variety of balloons. Love this card! So colourful and cheery! Beautiful card! Congrats on your 5 years! Such a cheerful card, Jen. Love those pretty papers you used for die cutting your balloons. Festive and fabulous, Jen. I so enjoy being on this CASology team with you. This is just fantabulous, Jen!! I love the bold script you used with the balloons. So fun! Love the big HB sentiment!